Did you ever think to make quiet book for your kid? But never had enough time? Didn’t know where or how to start? Well, let me help you make that first step. With free printable template you can start right away and create your first DIY quiet book plus you may refer to ultimate guide and find out all you need to know about quiet books. It is true, making quite book is not an easy job, also its time-consuming but it’s really worth to make one for your little ones because it provides great toddler activities. 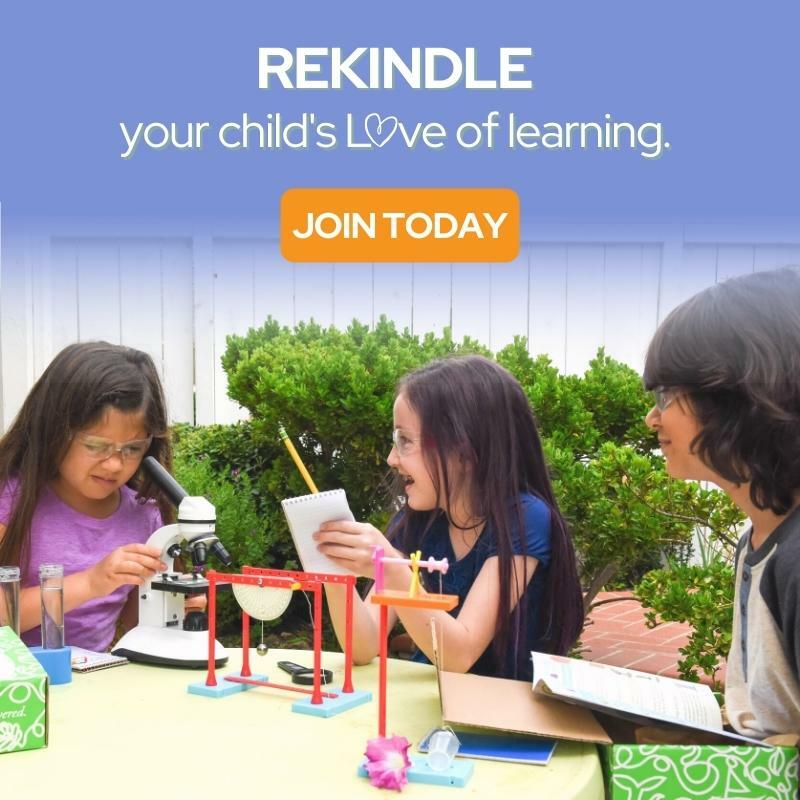 If you love to be creative and make homemade toys than this is a project for you. No mater if you don’t know how to sew. Today patterns can be designed, cut from felt (as felt doesn’t fray) and glued. So you can have quiet book made no-sew, without a single stitch. I often hear people say they still have their quiet book from childhood. Cloth book can’t be teared or eaten. It can be accidentally damaged but you’ll always be able to fix it. That is why quiet books are so precious unique toys and can last for many, many years, even few generations. I was very lucky to find great tutorial how to make quiet book when I wanted to make my first busy book for my nephew. 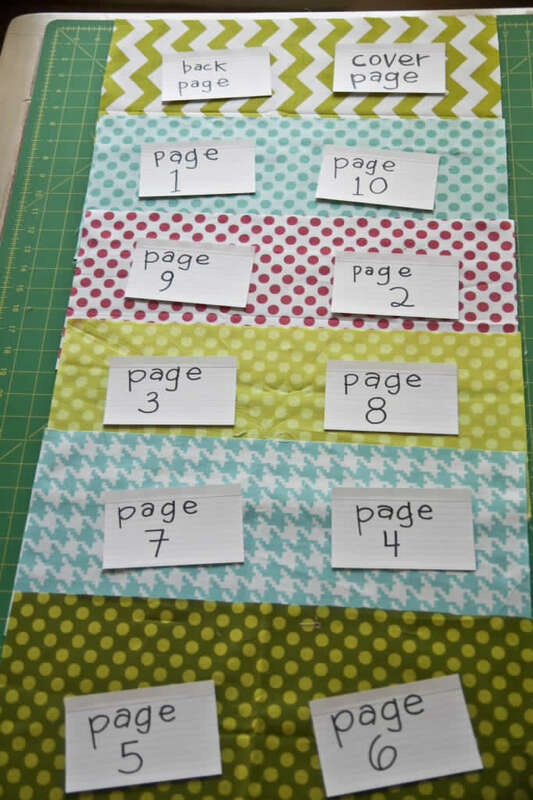 Vanesa G. at the ‘Lella Boutique’ blog showed very simple way to put all pages together into book. I would recommend that you follow Vanesa’s simple instructions. On her blog you can also find tutorial for beautiful Baby Boy Texture Book. Only disadvantage when you sew it that way you always have to do equal number of pages by four; 4, 8, 12, 16 etc. As I found many quiet book patterns and ideas all over the internet I haven’t use any patterns. I like to cut shapes on the go. That is what makes my books different one of another. But I’ve decided to make templates inspired with so many moms wanted to make their own quiet book. Hope I can inspire you too by providing free patterns. Now when you have idea how to make pages for your book lets start with your first 2 pages. 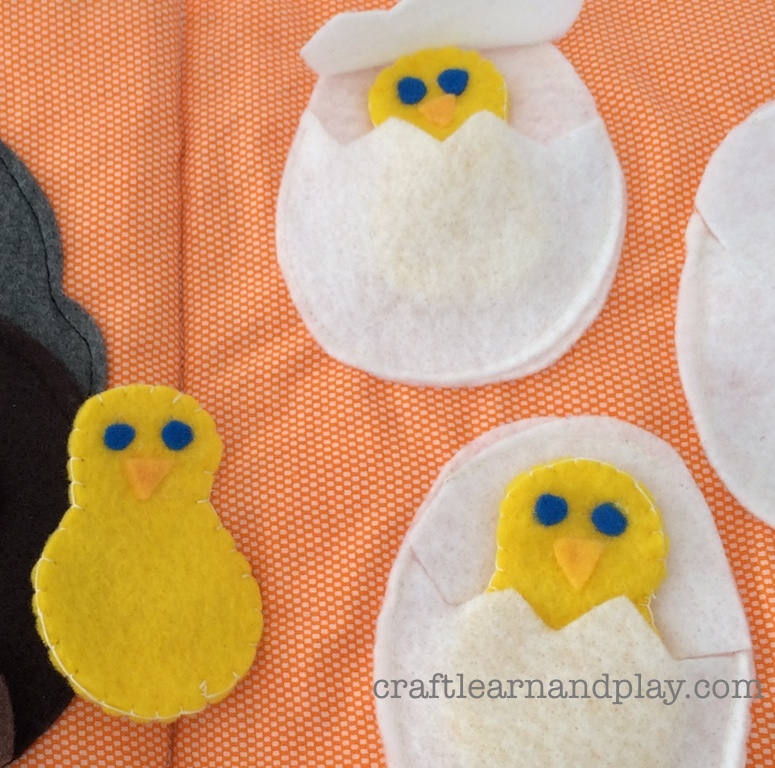 Toddlers love little yellow, snugly baby chicks. Not just because they are so cute, but they can relate themselves with other babies. 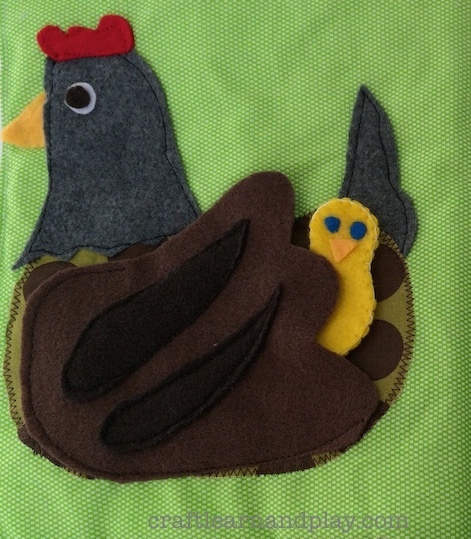 Quiet book is a great developmental toy and in this case Mother Hen quiet book page will provide great introduction to farm animals with many other benefits. 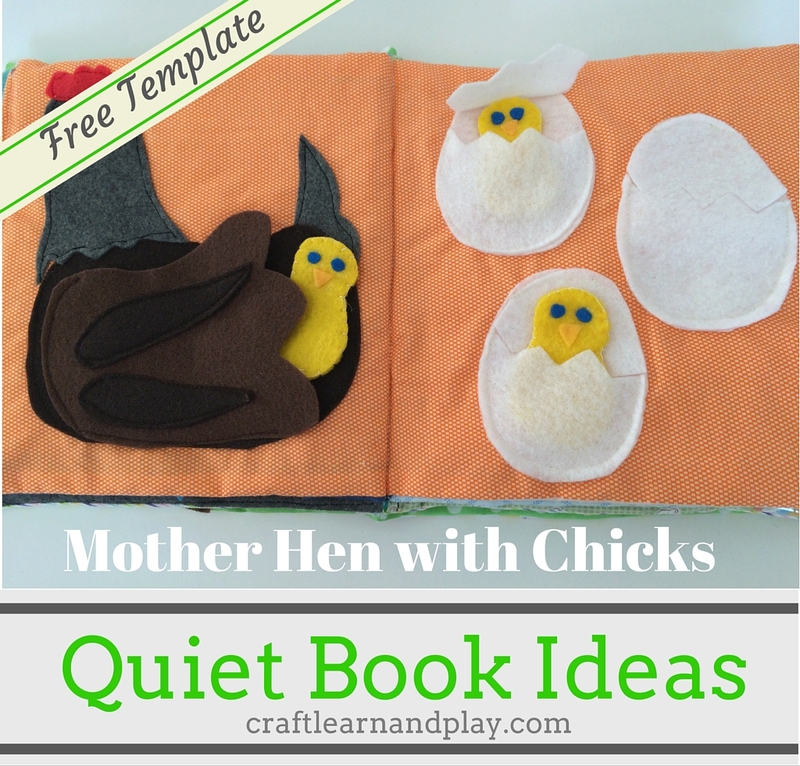 To make quiet book page Mother Hen with three little baby chicks you can use free printable. For making hen’s body I sometimes use dark cotton fabric, but usually I will just use Felt 1.5 mm thick for everything because it is so easy to work with it. Pattern will perfectly fit dimensions 8×9 inches of each page. When you are planing book pages you can cut fabric in 16 x 9 inches size. Your baby will not only enjoy playing with it but learn many developmental skills. Playing with mommy hen and putting her babies under the wing can help your child to feel more safe and secure as he can relate to idea of being protected by his mommy. 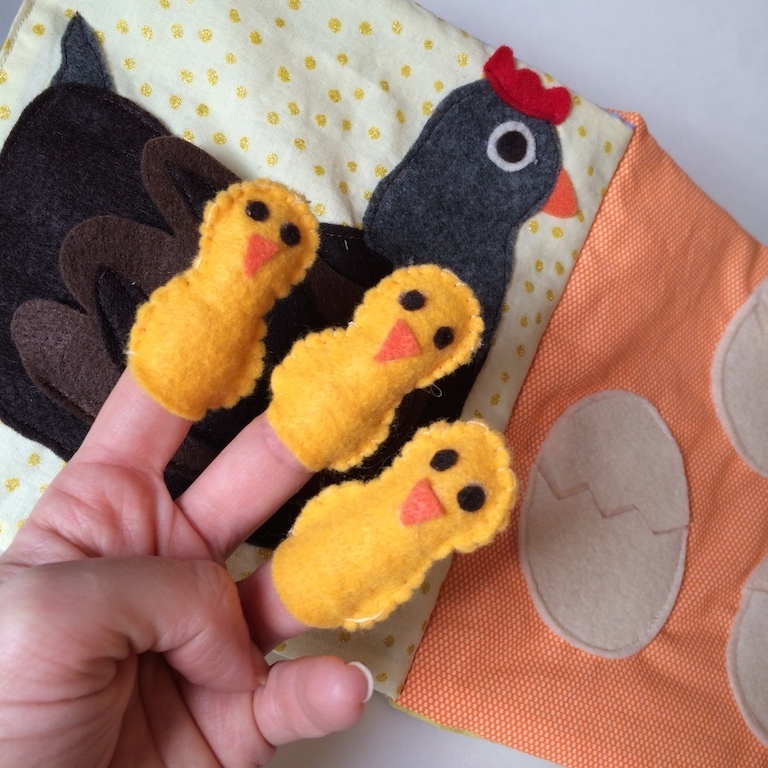 Finger puppets would be great to make too. Like those from the photo which I made in my new Easter Quiet Book. I hope I’ve inspired you to make your first DIY quiet book page. I would like to see your work so please keep me posted about your progress. If you liked this page please share it on social media. Thanks Mihaela. 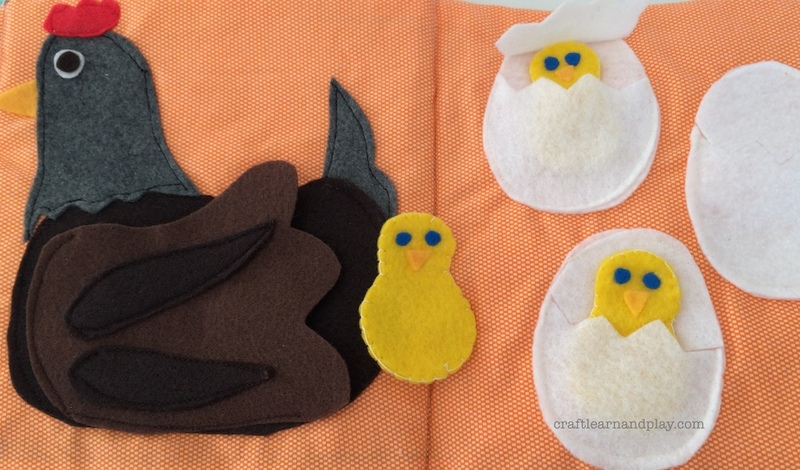 You can make amazing things no sew, using felt and glue, if sewing is not an option.